NEW YORK- Singer Moses Ssali commonly known as Bebe Cool represented Uganda to New York, USA on United Nations Tuberculosis fight. 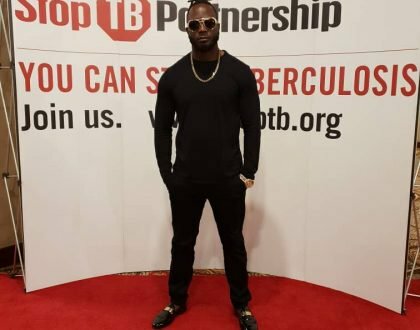 Bebe Cool was nominated Ugandan TB ambassador by Uganda Stop TB Partnership (USTP) in collaboration with their Geneva Partners United Nations Office for Project Services (UNOPS). In the ongoing United Nations High-Level Meeting on Tuberculosis (UNHLM) from 23rd to 27th September at the UN headquarters in New York, the singer was tasked with raising awareness about Tuberculosis and drawing the public attention towards its plight in Uganda. “To support the Uganda Stop TB Partnership, Ministry of Health and UNOPS in the campaign to end Tuberculosis in Uganda is a big responsibility that I and many Ugandans should embark on to save lives that are lost each passing day because of this killer disease. Am proud to take on this responsibility for my motherland Uganda,” said Bebe Cool. While in the meeting, the artist performed several hits including Kabulangane which got the UN Executive Director to Stop TB, Lucica Ditiu get on her feet to dance. It should be noted that this is not the first time the singer is taking up a big task to promote health. He has often raised money to support children with cancer, with surgery in India. Tuberculosis is a potentially serious infectious bacterial disease that mainly affects the lungs. The bacteria that cause TB are spread when an infected person coughs or sneezes. Most people infected with the bacteria that cause tuberculosis don’t have symptoms. When symptoms do occur, they usually include a cough (sometimes blood-tinged), weight loss, night sweats, and fever. Treatment isn’t always required for those without symptoms. Patients with active symptoms will require a long course of treatment involving multiple antibiotics.